Repeating after Jesus is dangerous. It can get you killed. This is why the disciples gave the cat their tongue, why they feigned deafness, laryngitis and amnesia when the authorities came to arrest Jesus. “Jesus who? I’ve never met him before in my life.” They didn’t even want to be found in the same sentence with Jesus because it was a death sentence. But Jesus was always a dead man walking. The disciples would rather take the walk of shame back to their homes rather than travel Calvary’s road with Jesus. They would rather hang their heads in disgrace than in solidarity with him. They said they wanted life eternal in heaven but, in the end, they wanted to live another day on earth. They saved their necks but not their reputation. They just didn’t think the man and his message were worth dying for. Repeating after Jesus is hazardous to your health. It is not the smartest or safest thing to do. The gospel of Jesus Christ should come with a warning label: This message if practiced faithfully may cause abandonment, baseless accusations, isolation and ridicule. It is also old life- threatening, prone to end friendships and relationships if taken seriously. The gospel is not medicine that goes down easy. Rev. Barbara Brown Taylor writes in her book Gospel Medicine, “(T)he medicine of the gospel—those healing stories did more to put people back together than all the potions in the world.” Still, we fold our arms, shake our heads and refuse to open our mouths to receive it. “It’s not sweet enough. It has a funny smell. It makes me feel strange or not like myself,” we say. I fear that we don’t take in more of the gospel because we don’t like the side effects. The good news is hard on our ears and bad for our hard hearts. Our lives as we knew them will not survive. Everything goes down Calvary’s hill from here. Because the devil didn’t make him do this. This is not a work of darkness but at the root of the cross is love. Jesus is not trapped in a relationship he wants to get out of. And while his flesh is weak, his spirit is willing. He decided to die, just to save me.” He could have saved face, saved his reputation, saved his mother the grief, saved the disciples the embarrassment but Jesus put all of that aside, just to save us. And he is not just going through the motions of commitment. Jesus’ body goes limp and he gives his life. They have nailed his body down but have only driven the point home. They take his body down and put him in what persons thought his final resting place. But, as we know, that’s not how the story ends. Mary Magdalene and another Mary went to Jesus’s tomb. There, they are met by an angel who tells them what to say. They ran from the tomb to tell the disciples what the angel said and are met by Jesus, who tells them what to say. They are spreading gossip. But the women are carrying the gospel. They don’t want the people to get the story straight. Perhaps, they did not expect Jesus to keep showing up but here he is in Galilee and on a mountain. Some lift their hands in worship and others lift their hands with questions. Clarence Jordan said, “The crowning evidence that Jesus was alive was not a vacant grave, but a spirit- filled fellowship. Not a rolled away stone, but a carried- away church.” People are always going to talk and tell lies about where Jesus is and what his disciples are doing. Pay them no mind. You know what you saw. You know what he said. You know what he asked us to do. Today, be reminded that the world doesn’t need more small talk. As Jesus commissioned the disciples after the resurrection, so he charges us. There are lots of stories circulating these days but this one is ours. No matter what you hear, Jesus says, “Tell them what I said.” But I must warn you—repeating after Jesus can be dangerous. Barbara Brown Taylor, Gospel Medicine, (Plymouth, United Kingdom, Cowley Publications, 1995), ix. The Editors, Bread and Wine: Readings for Lent and Easter, (Walden, NY: Plough Publishing House, 2003), 36. Quote offered in the opening of Fleming Rutledge’s The Crucifixion: Understanding the Death of Jesus Christ, (Grand Rapids, MI: William B. Eerdmans Publishing Company, 2015). The Editors, Bread and Wine: Readings for Lent and Easter, (Walden, NY: Plough Publishing House, 2003), 140. “I’ll do it when I’m good and ready.” “It’s just not the right time. I need more time.” But in matters of faith, we are never truly good or really ready. Filthy rag righteousness, we could never clean up the mess we’ve made on our own. The Apostle Paul tells the truth and shames us devils, writing to the Romans, “While we were yet sinners, Christ died for us.” Sinners never clean up real nice, which is why we need Christ’s push broom- cross. There is waning interest in the kingdom of God and less and less time to pursue it as we spend much of days building our own. Likewise, we behave as if we can put God on a waiting list, as if God is comfortable to remain on the back burner, as if our getting right with God can be rendered in installments, as if we are on a payment plan. A little here, a little there, we attend four Sundays in a row and then our affection grows cold. But, the words of the penitent thief change the conversation on conversion. Like Judas, the decoy disciple who fakes it until he can make a deal with the Pharisees, he is a pickpocket, a bandit, a robber. We don’t know his name and he was not long a Christian. A new member of the body of Christ, he wasn’t baptized, didn’t join a church, didn’t attend a new member’s class or a single worship service. But he did what really mattered in the end. He saw a future after death and life beyond the grave. He was a late bloomer, but he bloomed, nonetheless. “No cross, no crown,” the thief is a follower, not an admirer, a distinction made by Soren Kierkegaard. He says, “Admirers are only too willing to serve Christ as long as proper caution is exercised, lest one personally come in contact with danger. They refuse to accept that Christ’s life is a demand. In actual fact, they are offended by him.” Thomas a Kempis said, “The cross… is unavoidable. It waits for you everywhere. No matter where you may go, you cannot escape it, for wherever you go, you take yourself along. Turn where you will—above, below, without, or within—you’ll find the cross. … (But) if you willingly carry the cross, it will carry you.” If we are to get to heaven, then this is the price of admission. There is no way around the cross. The thief only lived for Jesus for a few hours. Nor theological red tape, no right hand of fellowship, no business meeting, no Robert’s Rules of Order, no vote, still, Jesus extends the invitation, ‘Truly I tell you, today you will be with me in Paradise” (Luke 23.43). The thief is Jesus’ personal guest. There is no waiting period. If you don’t know Jesus in the pardoning of your sins, then this is a good Friday to be introduced. Michael Horton, Christless Christianity: The Alternative Gospel of the American Church, (Grand Rapids, MI: Baker Books, 2008), 10-11. It is part of his foreword for the book. [3 Michael Horton, Christless Christianity: The Alternative Gospel of the American Church, (Grand Rapids, MI: Baker Books, 2008), 15-16. The Editors, Bread and Wine: Readings for Lent and Easter, (Walden, NY: Plough Publishing House, 2003), 57. The Editors, Bread and Wine: Readings for Lent and Easter, (Walden, NY: Plough Publishing House, 2003), 40. In John chapter 13, Jesus doesn’t just want us to talk about love. Jesus wants to see it, hear it, feel it in our fellowship. It is a love that Christians should be famous for, that Christian should be synonymous with. Jesus said and demonstrated it every day of his life and even in his death. Why can’t we? I love you. Three words that we want to hear from parents, spouses and significant others, toddlers and willful teenagers. I love you. These three words seal the deal, make real our commitment to another and communicate the seriousness of our relationship. Whether romantic or familial love, its expression deepens the bond shared. But, what of loving our neighbor next door and moving more closely, those we share our faith life with? Love as a practice of discipleship, unconditional love, is what we are to offer. Not this take it or leave it love, this if and when I feel like it love, this if the stars align and the mood is right kind of love, this if you do what I say temperamental love. Christ’s hands on the cross, extending and yet bringing us together, he becomes the supreme matchmaker. He says that we all belong to each other, that God made us for one another, that we are a perfect fit. His hands on the cross show the breadth of this acceptance and the depth of his commitment. He will go to the grave, proving this love. Paul Tillich said, “Love manifests its greatest power there where it overcomes the greatest separation.”[i] Bridging time and eternity, our sin and God’s righteousness, Jesus demonstrates the sovereignty of his love. 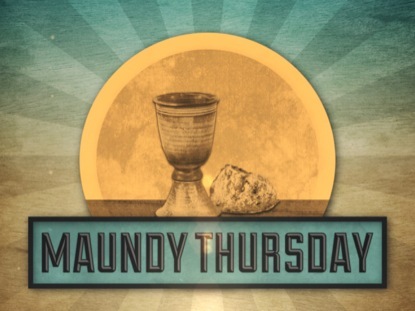 Maundy Thursday is the first day of remembrance services leading up to the resurrection. Maundy comes from the Latin word mandatum, from which we get the word mandate, and means commandment. As captured in John’s gospel, it is a reminder of the new commandment Jesus’ gave his disciples. John says that Judas has left the building. In response, Jesus says, “Now the Son of Man has been glorified, and God has been glorified in him.” Not matter what happens or how tough it gets, it is all for God’s glory. Nothing personal but deeply spiritual, Judas’ betrayal signals that Jesus’ time with the disciples is running out. “Just as I have loved you”– through thick and thin, sink or swim, no matter what it takes, I am all in. This is all that matters to Jesus. This is what he expects from his disciples. It is a kind of dying wish and all that he has to give. His legacy is love. Jesus is the model of tough love. On the cross, his love will take a beating, be buried and still get up with arms extended. As his disciples, we are called to do the same. [i] Paul Tillich, Love, Power and Justice, (New York, NY: Oxford University Press, 1954), 25. This little light of mine, I’m gonna’ let it shine. Let it shine! Let it shine! Let it shine! Recently, three historic African American- led churches were burned to the ground in Louisiana. Yesterday, a suspect was arrested. He is the sheriff deputy’s son and in the neighborhood. Before the arrest, persons feigned ignorance as to why someone would do this and what it meant. It could be a hate crime but they would wait for more evidence. Why else would someone burn a church? What other list of reasons do persons have for the destruction of holy spaces frequented and led by African American people? The burning of African American- led churches is not new and neither is the rationale. These churches were targeted to terrorize, to stoke fear within African American communities and to maintain the lie of white supremacy. How many times does this need to be said? How many books and articles need to be written? Interviews scheduled and given? How many classes offered and taught? How many papers written, exams taken and presentations made? How many degrees in African and African American history earned? How many movies and PBS specials are needed to document this truth? How many times does this need to happen? How many more exhibits and examples of churches burned do we need to see? How many more Black History Month highlight reels before Americans accept the realities of race? Our feigned disbelief and continual willingness to locate this fire starter outside of us is part of the problem. It is why the fires spread. The sheriff deputy’s son, he is one of us and closer than we think. That a relative of a law enforcement official brings the past and present together is too close for comfort. Don’t just change seats; switch churches. Get up and follow Jesus somewhere outside of your comfort zone, gated community, tradition, perspective, cultural and personal experience, worship style. Jesus did it and if we are following Jesus, we should too. Don’t spend your whole life pointing out the problem. Don’t just shake your heads; put your heads together. Figure it out. Solve it. Because if you meet Jesus and do not walk away from life as you knew it, then you did not meet Jesus. If you and I can meet Jesus and return to our regularly scheduled programming, then we may have met Jesus but we do not know him. Life with Jesus does not consist of a mere introduction but a lifelong conversation to include long walks like those with the disciples on their way to Emmaus. We need to listen to Jesus until our hearts burn (Luke 24.32). Because isn’t it a sad commentary that Christians in America cannot come together one day a week for an hour or two, that though Christ prayed that we might become one, it is hardest to answer and to embody this prayer on Sunday (John 17.21)? That we have integrated businesses and schools, hospitals and cemeteries, buses and hotels, lunch counters and restrooms but not sanctuaries? That praying hands still section themselves off to worship the God who “so loved the world”? That a space marked sacred still has the signs of segregation hanging above its doors, that our churches secretly or unconsciously signal, “For white people only” or “For colored people only”? If anything, Sunday should be the one day that we can come together. Or, is the Holy Spirit not at work or unable to overcome the challenges of our flesh? What do we walk in if not the Spirit and where are we going if we are not walking in the spirit of truth (Galatians 5.16; John 16.13)? We cannot claim the creative power of God, the resurrection power of Jesus and the fire power of the Holy Spirit but continue on as if powerless to challenge and change the social realities of race. What of this new identity in Christ? During this season of Lent, we are called to give up our carnal cravings, our fleshly feelings in order to shorten the distance between us and Jesus. Friends, I assure you that race is not the way. We are no closer to Christ than when we first begun if we put anything before or in front of Christian: black Christian, white Christian, Republican Christian, Democratic Christian, female Christian, male Christian. Christ is all or nothing at all (Galatians 3.28; Colossians 3.11). Following Christ is a one way street and it leads to Calvary. We cannot continue to follow the prescriptions of race and claim we want to go all the way with Jesus. Because it is a death walk; race and our racialized identities simply cannot survive.